Up for review today is the Carolina Blue Maduro Gran Robusto, a beautiful cigar in an elegant gran robusto size. Carolina Blue is a relatively new company which was founded in 2016 as a partnership between Francisco De La Cruz and Christopher Moore, who had recently retired from military service. Our goal is to create an amazing cigar experience for all levels of cigar enthusiasts while maintaining exemplary customer service. Pride, care, and strict attention to detail goes into each cigar we make. Our company’s foundation is deeply rooted in the legacy of our families’ subsistence tobacco farming in the community of north Harlowe in eastern North Carolina. We matured from those indelible youthful experiences, and have incorporated the same pride and tradition from our tobacco fields to the Dominican Republic. So, Carolina Blue is a new company that clearly has a big dose of energy and enthusiasm. Let’s see how the maduro performs. The Carolian Blue Maduro features a rich, chocolate brown Maduro wrapper with a bit of toothiness and a slight oily sheen. 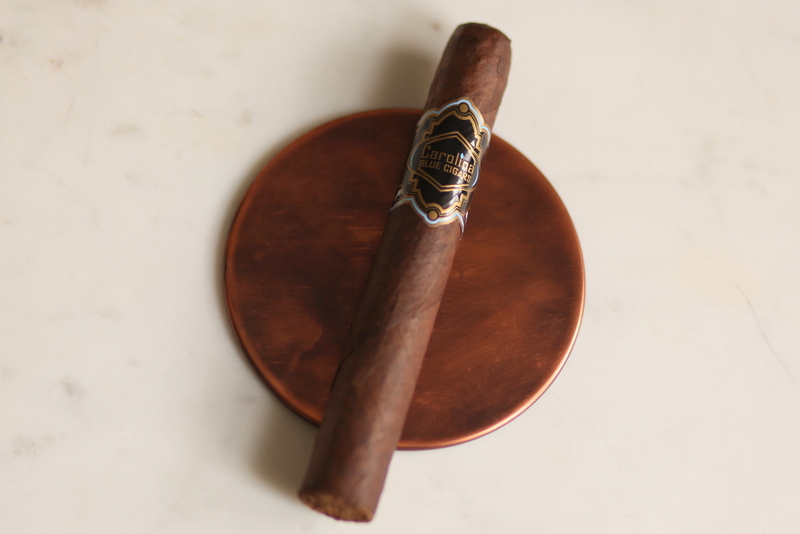 The cigar is moderately springy to the touch and feels evenly packed the length of the cigar. I really love the band on this cigar, which you can see plays nicely in the photo off of the copper metal coaster. It’s a look that is unique among the many similar, more traditional bands on the market today. The pre light draw has just the right amount of restrictiveness and reveals mild notes of caramel, cocoa, and earth. The Carolina Blue Maduro opens with rich, smooth smoke that is just under medium in body and strength. Smoke production is excellent and the draw is great. There’s a decent amount going on flavor wise, with some sea salt cocoa, savory spice on the tongue, cedar, and white pepper on the retrohale. It’s a profile that reminds me of some Quesada blends. At half an inch in, strength increases a bit to medium. The spice begins to take prominence and I pick up an interesting, quite distinct peanut butter note. The finish is long with a good dose of salt and spice. At this point, there’s a decent amount of complexity, but I’m not sure the flavors are totally harmony. Behind all of the flavors mentioned before is a distinct bitter note which cuts through the pleasant notes at times. Heading in to the second third, some new flavors emerge, including raisins and cinnamon. The strength has drawn back to mild medium, though the retrohale remains strong, with lots of white pepper and charcoal notes. Construction is still perfect, with a razor straight burn, a strong ash, and great smoke production. The final third is my favorite portion and where I think the flavors come into a good balance and at the perfect medium strength. Raisin, cocoa, cedar, spice, and none of the bitter notes in the second third. As the final inch of the smoke burns, the ash continues to hold and the burn is sharp and straight. Carolina Blue offers a nice array of flavors, though at times it struggles to find good balance. The bitter note at times distracted from what the cigar has going for it as well. Overall, for the company’s first blend, I think this is a strong showing. 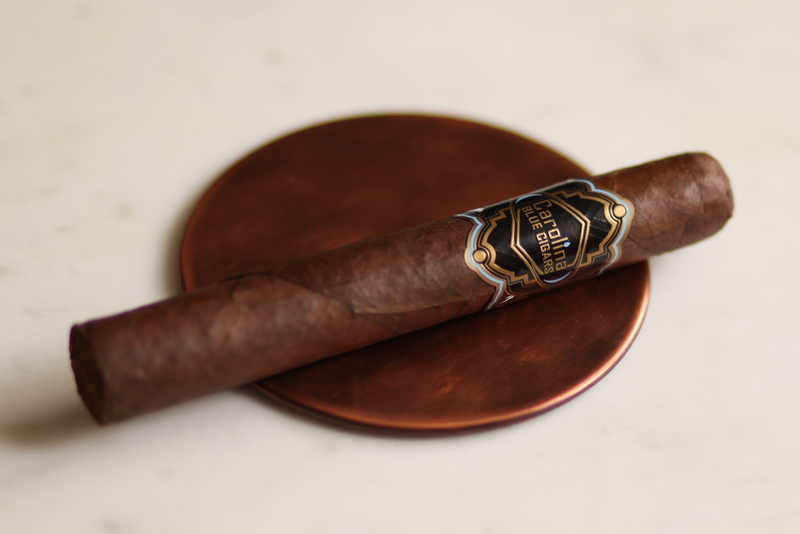 It packs a fairly traditional Maduro profile which bears some similarities with the Rockefeller Maduro. You can learn more about and purchase Carolina Blue Cigars on their website. If you want to learn more about Christopher Moore and the story behind Carolina Blue Cigars, check out this interview he did with Taste the Dram. p.s. shout out to Gene Kizhnerman over at Taste the Dram for gifting this cigar for review.